Toronto Dogs Directory: Tooth Care For Dogs - Give It A Try! Tooth Care For Dogs - Give It A Try! About 80% of dogs have signs of gum disease by age three. It is important to have your dog’s teeth and gums examined by a veterinarian regularly. Your dog cannot clean his teeth by himself! Canine teeth brushing and oral care will not only keep your dog’s teeth clean and breath fresh, but can help prevent a number of problems in the future. If you notice a build up of tartar and plaque around your dog’s teeth, it is recommended to have your dog’s teeth cleaned by a professional before you begin cleaning them yourself. Caring for your dog’s teeth is just as important as caring for your own. Ideally, a dog’s teeth should be cleaned every week. However, cleaning your dog’s teeth can be time consuming and even a little tricky to do. There are treats available to give to your dog in between cleanings as well. 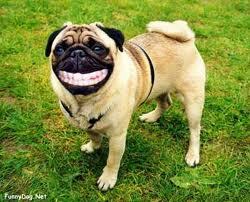 - When beginning teeth care at home, try to brush your dog’s teeth once or twice a week so he can get used to it. Once you get into a routine, it will be easier for you and your dog. - You can use either a toothbrush or a finger brush for cleaning your dog’s teeth. Test them out to decide which is best for you and your dog. - Find a comfortable position, and grab a good hold of your dog. You need to be able to hold his lips up and away from the teeth for proper cleaning. Your dog will probably pull away the first few times you clean his teeth. - Brush in circular motions, just as you would your own teeth. Don’t scrub the teeth too hard! - Don’t forget to brush the back teeth and the gums as well. Using a toothbrush is best to reach the back teeth. - After you are done, give your dog some water. He will likely be thirsty from the toothpaste, and from having his mouth open while the teeth are being cleaned. It is important to note that you should never use human toothpaste on your dog! Toothpaste is not meant for humans to swallow, and certainly not dogs. There are toothpastes available specifically for dogs that can be purchased at your local pet supplies store. Having your dog’s teeth checked by a veterinarian regularly will make cleaning your dog’s teeth cleaning easier. Your veterinarian will be able to give you more information about teeth cleaning and care as well.